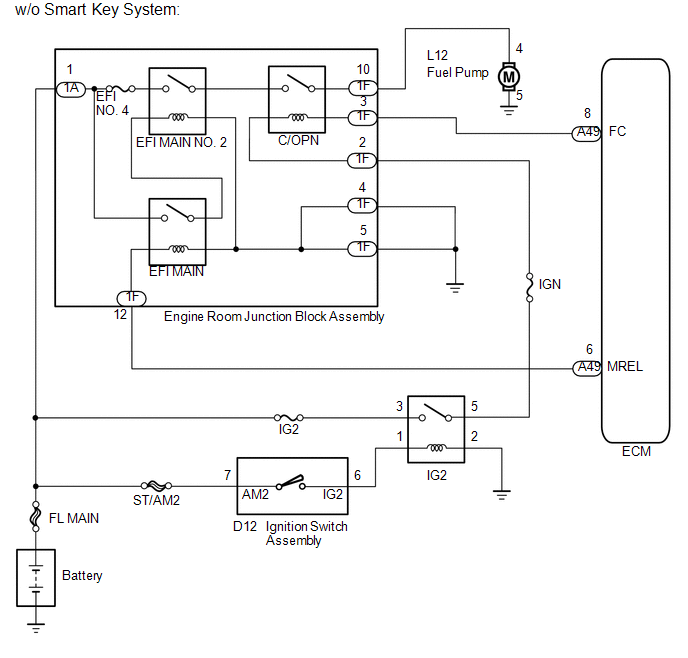 When the engine is cranked, the starter relay drive signal output from the ignition switch is input into the STA terminal of the ECM, and the NE signal generated by the crankshaft position sensor is also input into the NE+ terminal. When the ECM interprets that the engine is cranked, it turns transistor Tr1 in the ECM internal circuit on. The current flows to the C/OPN (Circuit Opening) relay when Tr1 is turned on. Then, the fuel pump operates. While the NE signal is input into the ECM when the engine is running, the ECM turns Tr1 on continuously. 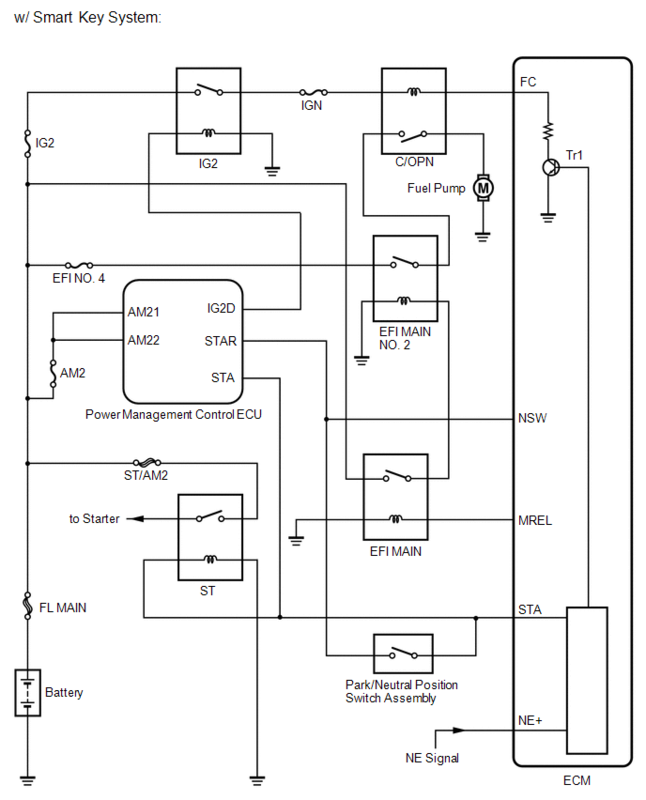 When the engine is cranked, the starter relay drive signal output from the STAR terminal of the power management control ECU is input into the STA terminal of the ECM, and the NE signal generated by the crankshaft position sensor is also input into the NE+ terminal. 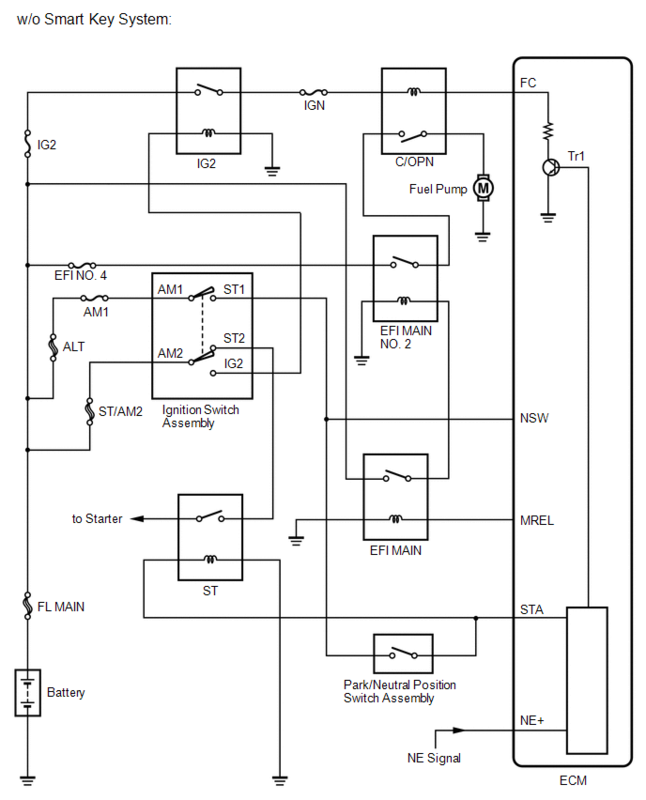 When the ECM interprets that the engine is cranked, it turns transistor Tr1 in the ECM internal circuit on. The current flows to the C/OPN (Circuit Opening) relay when Tr1 is turned on. Then, the fuel pump operates. (d) Check whether the fuel pump operating sound occurs when performing the Active Test on the Techstream. Fuel pump operating sound occurs. (a) Inspect the C/OPN relay (See page ). (c) Disconnect the engine room junction block assembly connector. (c) Disconnect the fuel pump connector.